Alvarez vs. Gomez: Can Alfonso give Canelo problems? By Jason Kim: No.6 ranked WBC light middleweight contender Alfonso Gomez (23-4-2, 12 KO’s) says that he’s still improving as a fighter despite his advancing age. He’s currently 30-years-old, and hasn’t taken on a really tough opponent since being knocked out three years ago in the 5th round by Miguel Cotto in a fight for the WBA welterweight title in April 2008. Now three years later, Gomez will be fighting for another world title, this time against 21-year-old World Boxing Council junior middleweight champion Saul Alvarez (37-0-1, 27 KO’s) at the Staples Center in Los Angeles, California. Gomez and Alvarez are both around the same size and weight. However, Alvarez is a much bigger puncher and has the better boxing skills. The hand speed is pretty evenly matched between the two. But unless Gomez has really improved on how he’s looked in his last couple of fights against Jose Luis Castillo and Calvin Green, he’s going to get wiped out in this fight by Alvarez. Gomez doesn’t have the power to just stand in front of a puncher/boxer like Alvarez all night long and expect to stay in there. It would take a super human performance for Gomez to be able to stand up to the heavy shots that Alvarez will be drilling him with. He can’t get into a back and forth type of fight where he trades shots. That would be a suicidal game plan for Gomez to fight. He’s got to make Alvarez miss and counter him with shots. Unfortunately, Gomez has never been good at picking off shots or making his opponents miss. He usually blocks shots with his head and is good at firing back with his punches. But that’s only worked for him when taking on guys that can’t really punch. We saw what happens to Gomez when he faces guys that can punch when he was knocked down over and over again by Cotto in a thee knock down loss. 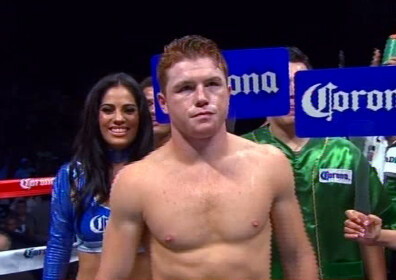 Boxing » Alfonso Gomez » Alvarez vs. Gomez: Can Alfonso give Canelo problems?